Tendergate. Sabahkini, leading news portal in Sabah, calls it Tender-gate and has promised a series of newsbreaks on the issue, which involves the MoF (Najib Razak, the PM, is Minister of Finance) and the Ministry of Rural and Regional Development (Shafie Afdal is Minister). The article attaches a copy of a memo from MoF rapping Shafie Afdal's sec-gen for approving an RM11 million rural roads project in Sabah and Sarawak without calling for a tender. The MoF, in the memo, orders a probe into this (and, I've learned, several more similar projects) and wants Shafie's ministry to take action against the ministry officers involved. Good for the MoF, transparency and openness. We await Shafie ministry's explanation on this matter. Hopefully, it can come before Part Two of Sabahkini's Tendergate series. Rocky, very good for you to advocate for transparency. With the election is near,SAD to say that most projects will be awarded without tender in order for UMNO to increase its election warchest. I did a small analysis of the BN and UMNO election fund and the total amount is RM1.4 BILLION. With our national debts of RM 407 Billion which is 53% of Gross National Product (Keluaran Negara Kasar),BN and UMno do not deserve to be elected again. But Rocky,jangan takut,with the funding of a Staggering amount of RM1.4 bILLION, IT WILL BE DIFFICULT FOR YOUR PARTY UMNO and BN to lose in the next election. In order to protect our country and our future generation,I hope Umno and BN will lose but with the funding that Umno AND BN have,it will difficult for Pakatan to win. Yeah a good move but I wish to draw attention into another brewing storm in a tea cup being brewed by Gilo Pungguk Anwar. You see in trying to con us into believing that the respected statesman Dr M was lying about the Worldbank loans/borrowings scandal, Anwar and his PKR clowns have blown their arses wide with self-inflicted gunshot wounds. 1. The agreement that consummated the contentious loan that Dr M purportedly took from the World Bank was signed in JUNE 1998, a full, 3 MONTHS before the axe ripped up Anwar's arse. It was initialed by someone from the Treasury named Dali M. Hashim on June 18 1998 and who else but Anwar bin Ibrahim was ensconced as Finance Minister in the Treasury during the said period. Surely, he would have been privy to that agreement done by HIS underling hence to deny any knowledge whatsoever now is a tad too strange! 2. The tranche of US$ 300 million was disbursed on the premise that certain programmes (outlined in Schedule 3 of the same agreement) were implemented. In fact para 1 of the agreement aludes to a letter dated May 30 1998 regarding this. from the worst-affected banks and financial institutions. of the Malaysian Economy (Kuala Lumpur: Government of Malaysia, 6 April 1999), pp. 25–26, Box 1. Both these extracts show to what extent Anwar had fulfilled the WB demands ( as outlined in Shedule 3 of the agreement), a precondition for the June 1998 agreement of assistance. This one is orchestrated by a powerful figure in Sabah who is worried about the minister's popularity. Jangan malu2 ... spill the beans. You know I don't censor commenters' theories. In Mr George Choo's case, a very interesting analysis, indeed. Going by your theory, Umno/BN's warchest will be contributed largely by Chinese-owned companies. A lot of people seem to think that the Cainis don't really support BN and Umno anymore and in view of that, I am afraid many will see your analysis as more your personal fantasy. U talk like tin kosong. No proof and simply agak-agak. Simply hearsay. U are anti BN and UMNO. All this while that come into your sour grape mind is BN and UMNO only do nothing else but corruption. And your mind has been corrupted by that corrupt-thingking too. If BN and UMNO are so bad, you won't be like what you are today. You will be like the Somalian! if they wanted to investigate, investigate seriously. dont try to put a show. i cannot believe ksu is involved. tell me which ksu which is brave enough to come up with direct nego? dont tell me ksu is bigger than the minister. 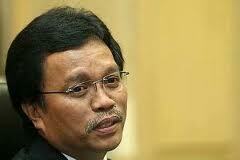 i hear private secretary Minister shafie is very wealthy. we are chatting about just private secretary. not yet the minister. everyone knew how shafie run the ministry. so if want to investigate, investigate also the minister and private secretary. podah Rocky...... bila MoF nak sisaat kes lembu shahrizat ????? PM Najib sudah bisu ke ?? bila mahu ambil tindakkan sama shahrizat, PM ??? memang useless punya PM Najib !! how will PKR/PAS govern the country? let's assume they win.. DAP will surely not shared what they have and DAP is very racist. if we vote for PKR/PAS what assurance can they give to make sure malaysia and the malays are moving forward and not beggers in their own country? anuwar has no money and lots of talk only, PAS has no money and no intellectual. DAP will swindle all. Aiya! this 11 million bucks s is small change to those corrupt umno guys....perhaps sudah jadi bukit already for all those years... of thieving....??? Preference is to bring the China style justice where the corrupts get ze bullet after a swift trial....then malaysia overnight i gaurantee this thieving stops...period! What about the RM9 billion contract for 6 Littoral Combat Vessels awarded to Boustead? Japan is buying 42 F-35 stealth fighter aircraft from the US. The aircraft costs about US$133 million each, according to the US Government Accountability Office. The RMAF must be feeling a tad deprived of new and shiny toys! Rocky, it seem you pick and choose who you want to lead to slaughter. or maybe big Boss instructions. Transparency is always good, but how about writing on NFC? Your good friend KJ seem to have put up a "good defence" (hehe) for it. Please don't shout "transparancy" when its intention is a political kill. You baru tau ka? They have been stealing for ages. For the US Navy, the average cost to buy a Littoral Combat Ship (LCS), inclusive of weapon systems, should be US$430-440 million (according to Sean Stackley, US Department of Navy Undersecretary, quoted in Wikipedia). This was after an intensive competitive tender exercise that lasted over a number of years, and where US Congressional panels had an oversight role. These are the LCSs, a number of which the US Navy has proposed to station in Singapore to help patrol the South China Sea, the Singapore Straits and the Straits of Malacca, under the latest USA DOD initiative to "counter" an expansionist Chinese Navy. Malaysia has ordered 7 LCSs for RM9 billion (or is it 9 LCSs for RM7 billion) from Boustead, which is reported to have partnered with a European shipyard. Was there an open tender for the Malaysian LCSs? Or are defence procurements immune from scrutiny and oversight by Parliament? At least, we can look forward to a possible future scenario where the Malaysian Navy LCSs could participate in joint exercises with the US Navy LCSs in regional waters. An UMNO winnable candidate is one who can steal without getting caught. Or one who can ignore MoF directives. Or one who can tell PM not to squeeze his balls. All UMNO candidates are winnable. Including Shafie Apdal. Cakap lah Nak Puji Najib ...Jangan pula guna putar konon Najib Clean dan Ahli Kabinet dia Kotor..
What Crap lah lu ni...He's not dumb to see what you doing! What set of minds? CIBAI! Typical UMNO sandiwara, and Latuk Locky being made used of as spinmeister. How much, Latuk ? Oppositions are not doing the same if the take over putrajaya? I want to believe they don't have a warchest, well at least one don't need. This one got foreign support. so najib and the gang didnt pay u...the question is rocky...who pay u?why this is important..so we would know which news is true and not true...dont tell us...nobody's paying u...at least..tell us..which team do u support? Mahathir& Muhyiddin? http://bursamynews.blogspot.com/2011/09/mengkuang-dam-sub-contract-lifts.html what about this morsel thrown to the tigers? Cepatlah taubat, ingatlah Tuhan sikit.